CO2 emissions from restaurants have increased over the past five years in Japan. As a result, countermeasures such as hybrid heat source systems that use renewable energy have gained increasing attention. In this paper, we assessed the efficiency of a hybrid solar-geothermal heat system including an adsorption refrigerator during its use in providing energy for air conditioning and hot water. We presented an energy prediction formula based on measured data on solar heat collection, cooling, and heating load. We also documented our evaluation of the performance of each component of the solar-geothermal heat system, i.e. the solar collector, adsorption refrigerator, and geothermal heat pump. And finally, we presented a case study on the use of this system in restaurants in a smart energy town in Japan. On solar collector, this study found that the heat collection efficiency during sunny and mostly sunny conditions were 28%. This percentage dropped to 23% for cloudy conditions and 11% for rainy conditions. On adsorption refrigerator, the Coefficient of Performance (COP) in summer was found to be lower than in autumn. On geothermal heat pump, the COP was found to be 4.5 during the cooling period and 4.3 during the heating period. Overall, the highest values for both energy consumption and energy utilization occurred in August, and the utilization efficiency was lower in winter than in summer. Moreover, the average annual energy utilization efficiency of the total system was 59.02%, while the Annual Performance Factor (APF) was 2.082. This study contributes to decision making and academic researches regarding the planning and implementation of energy-efficient cooling and heating system. Ministry of Economy, Trade and Industry, Japan, “Topics towards introducing renewable energy in Japan Report”, 2018. Ministry of the Environment, Japan, “GHG mitigation goal of Japan Report”, 2018. Japanese Ministry of the Environment, “GHG emission report in year 2016 (preliminary value)”, 2018. D.S.G., M. Maria, A.F.C. Fortes, R.P.G. deSouza, J.A.M. Silva, M. Carvalho, et al., “Carbon footprints for the supply of electricity to a heat pump: Solar energy vs. electric grid”, Journal of Renewable and Sustainable Energy, 10 (2), 2018. H. Getu, H. Philip, and M. Mark, “Seasonal sand-bed solar thermal energy storage in a region with extended freezing periods: Experimentally verified numerical simulation”, Journal of Renewable and Sustainable Energy, 9(6), 2017.
 International Energy Agency, “Technology roadmap, Solar photovoltaic energy”, 2010. https://webstore.iea.org/technology-roadmap-solar-photovoltaic-energy-2014. María Herrando, Christos N Markides, Klaus Hellgardt, “A UK-based assessment of hybrid PV and solar-thermal systems for domestic heating and power: System performance”, Applied Energy Journal, 161, 512, 2016. Chow TT. “A review on photovoltaic/thermal hybrid solar technology”. Applie Energy, 87. 365, 2010. SA Kalogirou and Y. Tripanagnostopoulos. “Hybrid PV/T solar systems for domestic hot water and electricity production Energy Convers Manage”, 47(18-19). 3368-3382, 2006. C. Cristofari, J. Canaletti, G. Notton, C.Darras, “Innovative patented PV/TH Solar Collector: optimization and performance evaluation”, Energy Procedia, 14. 235-240, 2012. E. Halawaa K. C. Changb M. Yoshinagac, “Thermal performance evaluation of solar water heating systems in Australia, Taiwan and Japan – A comparative review”, Renewable Energy, 83, 1279-1286, 2015. SA.Kalogirou, “Solar thermal collectors and applications”, Renewable Energy, 30(3), 231-295, 2004. J. Freemana I., Guarracinoa, S. A. Kalogiroub, C. N. Markidesa, “A small-scale solar organic Rankine cycle combined heat and power system with integrated thermal energy storage”, Applied Thermal Engineering, 127. 1543-1554, 2007. Alba Ramosab Maria Anna Chatzopouloua James Freemana Christos N. Markidesa, “Optimisation of a high-efficiency solar-driven organic Rankine cycle for applications in the built environment”, Applied Energy, 228. 755-765, 2018. María Herrandoab Christos N. Markidesa, “Hybrid PV and solar-thermal systems for domestic heat and power provision in the UK: Techno-economic considerations”, Applied Energy, 161, 512-532, 2016. M. Beccali, P. Finocchiaro, and Nocke B., “Energy and economic assessment of desiccant cooling systems coupled with single glazed air and hybrid PV/thermal solar collectors for applications in hot and humid climate”, Solar Energy, 83(10),1828-1846, 2009. M Herrando and C.N. Markides, “Hybrid PV and solar-thermal systems for domestic heat and power provision in the UK: Techno-economic considerations”, Applied Energy, 161, 512-532, 2016. 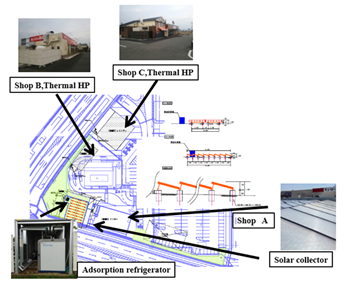 H. Shun and K.Nagano, Design and evaluation of one of the largest ground source heat pump systems in a large scale retail store. Journal of Environmental Engineering, 80 (709). 249-258, 2015. Mikako Maeta, Akihito Ozaki, “Study on Central Space Conditioning System of Residential Buildings with Air Circulation Utilizing Solar Heat”, The society of heating, air-conditioning and sanitary engineers of Japan,A-10, 37. 2013.